Ah, the question is this – is Mardi Gras early or late this year? In my humble opinion, I think it’s right on time: Feb. 17. In 2016, it’ll be on Feb. 9 and to me, that’s early. In 2019, it’ll be really late – March 5. The only dilemma this year is that Valentine’s Day (Feb. 14) is going to be jammed into our Carnival season. I’m in a quandary. Do I blend the purple, green and gold decorations of Carnival with the red and white of Valentine’s Day? Will I have to gently remind my husband, amid the hullabaloo of parades, balls and king cake parties, not to forget to order me flowers and get my box of Godiva chocolates? Or should I just forget about romance and keep on trucking to Fat Tuesday? And then, a month after that, I have to dig out all that green stuff for St. Patrick’s Day! Only in Louisiana do we have to party hard from the Christmas and New Year’s season and not stop until mid-March. Ain’t life great? Never fear, I’m here to give you suggestions how to celebrate all these special days with aplomb. First, let’s deal with Mardi Gras. 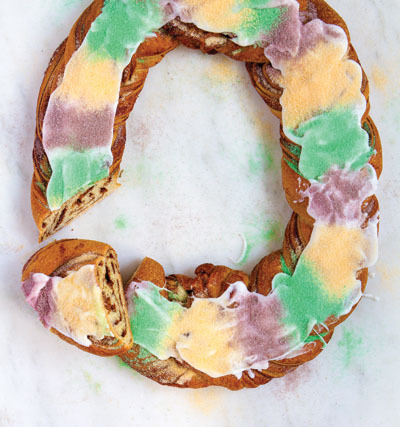 I know just about everyone can pick up king cakes at a supermarket, bakery or convenience store where you’ll find a wide assortment of those purple, gold and green confections, but why not do something special this year and make your own? I’ve been following this fairly easy recipe for over 20 years, and it is always a crowd-pleaser. In a large bowl, combine 1½ cups flour, ¼ cup sugar, salt and undissolved yeast. Heat the milk, water and butter until very warm, about 120 to 130 degrees. Add to the dry ingredients and beat for 2 minutes at medium speed of an electric mixer. Add the eggs and ½ cup of the flour. Beat on high speed for 2 minutes. Stir in the remaining flour (2 ¾ cups) to make a stiff batter. Cover tightly with plastic wrap and refrigerate for about 2 hours. Punch the dough down. Remove the dough to a lightly floured surface. Divide into 3 equal portions. Roll each to 28 by 4 inches. Brush with the melted butter then sprinkle evenly with the remaining ¾ cup sugar and the cinnamon. Beginning at the long end, roll each up tightly as for jellyroll. Pinch the seams to form long ropes. Braid, then form into an oval. Pinch the ends together to seal. Place on a greased baking sheet. Cover and let rise in a warm, draft-free place until doubled in size, about 1 hour. Bake at 375 degrees for 25 to 30 minutes, or until lightly golden. Remove from the baking sheet and cool on a wire race. Brush with the powdered sugar glaze and sprinkle with the colored sugars. Mix food coloring before adding the sugar. Preheat the oven to 500 degrees. Sprinkle the meat with salt and pepper. Rub it with the oil and one tablespoon of the butter. Broil or grill for 8 to 10 minutes on each side until well browned. Baste once or twice with about two tablespoons of the butter. Transfer the meat to a baking pan and roast for about 10 to 12 minutes, or until it’s slightly springy to the touch or registers about 135 degrees on a meat thermometer. Let stand for about five minutes before carving it into ³⁄8-inch diagonal slices. While the meat is cooking, sauté the potatoes in the remaining four tablespoons butter until golden brown. Keep warm until ready to serve. In a small heavy stainless steel or enameled saucepan, combine the vinegar, shallots, tarragon, salt and white pepper and reduce the liquid over medium heat to about two tablespoons. Remove the pan from the heat and add one tablespoon cold water. Add the egg yolks and whisk the mixture over very low until it’s thick. Whisk in the butter, one piece at a time, over low heat, lifting the pan occasionally to cool the mixture and making certain that each piece is melted before adding the next. Cook the sauce, whisking, until it is thick. Taste for seasoning. You may want to add a little more salt and white pepper. Add the parsley. The sauce may be kept warm, covered with buttered wax paper, in a pan of warm water. Go to your supermarket and get about a 7½ pounds corned beef. It’s packed in brine and some packages come with a seasoning packet. Put the corned beef in a large Dutch oven and add enough water to cover it. Add the seasoning packet and boil the meat over medium heat until tender. It may take two to three hours, and you will have to keep adding water to the pot to keep the meat submerged. Once it’s cooked, remove it from the boiling liquid, let cool a bit before slicing thinly to serve. In one very large pot (or 2 smaller ones), combine the cabbage, water, sugar, and vinegar. Cook on high heat until tender, about 1 hour, stirring occasionally. Remove from the heat and removed the cabbage with a slotted spoon. You make can make this in advance, and store the cabbage in the refrigerator with enough of the cooking liquid to keep it moist. When ready to serve, bring the cabbage and the liquid slowly up to a gentle boil to heat it thoroughly. As mentioned above, serve the cabbage with the corned beef, carrots, and potatoes. The traditional accompaniments, carrots and potatoes, can be cooked in either the boiling liquid from the cabbage or in the boiling liquid from the meat. That will give the vegetables are wonderful flavor. Plan on serving two carrots and one potato per person with the cabbage and corned beef. Oh, and I love to serve it all with a concoction of sour cream and prepared horseradish to give everything a little hit!